Hydroflex develops and manufactures specialised cleaning and hygiene products for cleanrooms and offers 360° cleanroom hygiene solutions. Hydroflex is a leading provider and manufacturer of cleanroom cleaning systems. Established as a family-owned company, we are specialised in dealing with the professional cleaning technology for four decades and in three generations now. Since 2009, we consequently realise our know-how in the field of CLEANROOM HYGIENE. With our specialised product solutions for manual cleaning and disinfection within the cleanroom, we regularly set benchmarks and allow cleanroom operators to ensure an optimal production hygiene worldwide. Among the proven product brands PurMop and PurWipe, we develop and sell certified mopping systems and wipes, which stand for highest efficiency, ergonomics and cleanroom suitability. Our customers, well-known companies from industry sectors Pharmacy, Medical Technology, Microelectronic and Optics, benefit from our strong service orientation as well as from our ISO 9001 certified quality management system and the detailed thought out system solutions. We have a worldwide distributor network as well as own production sites with cleanroom manufacturing. Our team supports you with pronounced expertise and long years’ experience in cleanroom hygiene and cleaning. Cleanroom operators in more than 40 countries worldwide work with Hydroflex products day by day – for a good reason. Convince yourself. Hydroflex sees itself as a competent problem solver for any kind of cleanroom cleaning. Always focusing on the user and a simple but safe cleaning of GMP and technical cleanrooms, our cleaning systems undergo continuous development and new materials are tested. Our constant aim is, to make working in highly sensitive and sterile cleanrooms as uncomplicated, safe and resource friendly as possible. We live a high practical orientation and close contact with our customers in order to meet our demands and to constantly question the state of the art. Because of the critical field of their application, cleanroom products are subject to high quality standards. Our products are exactly developed for the use in these sensitive areas and are tested extensively to their requirements. This is done in our own test labours and cleanrooms and in accordance with international recognised test standards by external institutes. When producing critical cleanroom consumables, Hydroflex relies to a 100% inspection policy and to a comprehensive and transparent documentation. This allows us to hydroflex-group.com provide you with the best possible support at the validation and qualification of our products. The important part of our quality philosophy is an extensive according ISO 9001:2015 certified quality management, which also follows the GMP (Good Manufacturing Practice) standards. We support you so that you can focus on the essential: The manufacturing of you products! 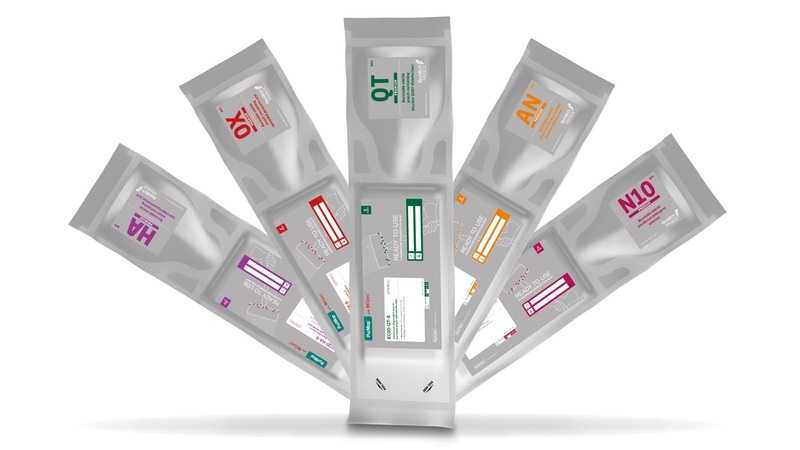 They fulfil the high requirements for safety and a consistent quality – our innovative presaturated cleanroom wipes of the PurWipe V-series. Compared with the manual spraying, presaturated wipes are offering a broad range of advantages. Especially if they are used for disinfection in cleanrooms. Very economical, the costs are equal to the costs for manually saturated wipes. 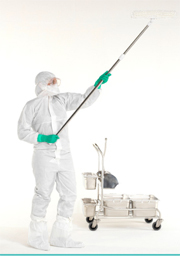 The innovative PurMop and PurWipe V-series are presaturated with disinfectant and ready-to-use. Your benefit: No spraying, no preparation and no effort! 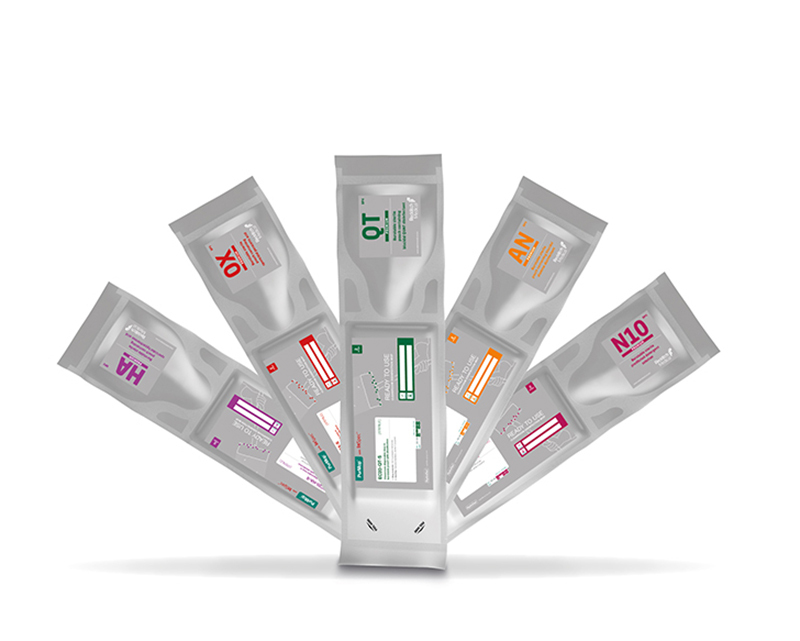 are delivered in reusable pouches. The innovative 2 in 1 solution: PurMop disposable mops with integrated disinfectant from InSpec. Select your individual solution! The completely new product concept from Hydroflex and Redditch Medical uses a special burst pouch technology to provide a disposable mop with a full range of cleaning and disinfecting agents specially designed for cleanrooms. The disposable mop and disinfectant are delivered in one packaging unit but are separated through a burstable compartment. For use simply burst the pouch, distribute the fluid and after a short waiting time the disinfectant will evenly and sufficiently saturate the mops. Thanks to the separation of the two components a long shelf life for mop and fluid can be ensured without reducing the effectiveness of the disinfectant over time. Safe Safe means that you always get a new and fully functional mop which will be soaked with the correct amount of disinfectant. There is no need to validate an additional trolley system. Simple Simple means that you only have to combine the fluid with the mop and after a short waiting time you can start with cleaning. 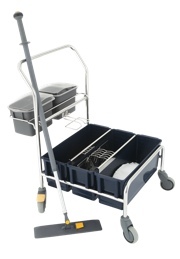 Neither cleaning trolleys nor the storage of additional disinfectants is necessary. Innovative! 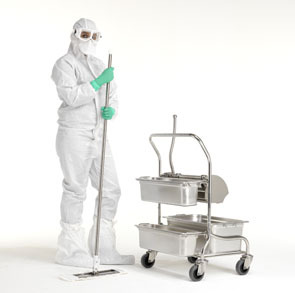 Rethinking disinfection of critical cleanroom areas! With the PurMop InSpec Ready-To-Use concept we are offering a completely unique and innovative solution for efficient cleanroom disinfection. As a 2 in 1 On-Demand packaging, this solution is simple, fast, safe and eliminates the need for additional storage of disinfectants or a trolley system.